There was to be no fairytale for the Clarets in the third round of the FA Cup at the Etihad Stadium after they had threatened to end Manchester City's hopes of the quadruple. Burnley had led through Ashley Barnes's first half strike but couldn't hold out to become only the second side to beat City at home in 45 games. The home side's retaliation, and the particularly crushing manner of it, typified a side fighting to claim every domestic trophy on offer this term. The Clarets were well worth their lead at the break after a typically organised and workman-like display against the unbeaten Premier League leaders. City had their chances, which comes as standard for a club who had scored 81 goals across the board, but they failed to test Nick Pope in the Burnley goal. Ilkay Gundogan hit the wall from a dangerously placed free kick, central to goal, with the home side's first real chance of note before full back Oleksandr Zinchenko, one of just three changes made by Pep Guardiola, cleared the crossbar from the follow up. The Clarets had a golden opportunity to take the lead soon after when Ben Mee headed Johann Berg Gudmundsson's corner across the face of goal but Nicolas Otamendi did just enough to prevent Barnes from converting. But City are capable of going from back to front at a frightening speed and within seconds of almost conceding the hosts almost scored. Leroy Sane sprung the counter and almost finished it off when whipping the ball left footed towards the far corner but the German winger's attempt dropped wide of the upright. 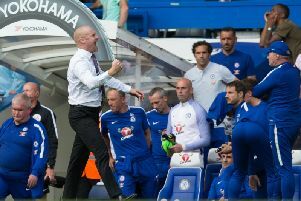 Sean Dyche's side took the lead in the 25th minute and it was only the third timke this season that City had trailed at home. John Stones made a hash of his clearance once Sam Vokes had helped on Pope's clearance, allowing Barnes, who has scored against Swansea, Stoke and Manchester United this term, to race clear and thump the ball past Claudio Bravo at his near post. Gundogan, Otamendi and Fernandinho all went close as the half wore on while Ukrainian Zinchenko's curling effort dipped on to the roof of the net. However, City were simply sumptuous after the break and their response hit Burnley like a sledge-hammer. You can't afford to switch off against Sergio Aguero for a second and, unfortunately for the visitors, the Argentinian punished them twice in as many second half minutes for doing just that. The striker's first came in the 56th minute when Gundogan's quickly taken set-piece caught the Clarets napping and Aguero slipped the ball first time past Pope. And his second was just as simple. With Matt Lowton caught in possession, Aguero fed the ball in to Sane, continued his run untraced to collect his team mate's clever back heel before rounding Pope and slotting home. That was pretty much game over. City were just unstoppable and Sane should've extended the lead when somehow lifting the ball over the bar with the goal gaping after Pope had denied Danilo at his near post. Sane did, however, make amends when turning from provider to goalscorer in the 71st minute, poking the ball in to the corner after Silva's pass had sent him goal side of Mee. Guardiola introduced £150m worth of substitutes in the second half with Bernardo Silva joining Kyle Walker and Kevin De Bruyne. And two of those combined to round off the scoring. Sane beat Pope to the Belgium international's cutting pass and squared the ball for the Portuguese midfielder to stroke home.